i took this picture around two months ago when i was with ron over at old town bar in the flat iron. meant to post this a long time ago. 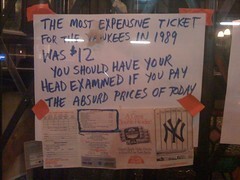 great reaction to the state of ticket prices. today i heard about a nyy package that is $500 per game, but you can eat all of you want while enjoying a $150 face value seat. who can eat $350 of ballpark food?!? !